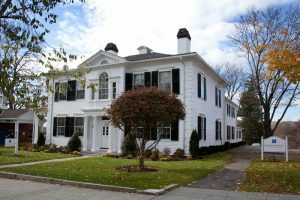 The former Degen family home in Brookfield. 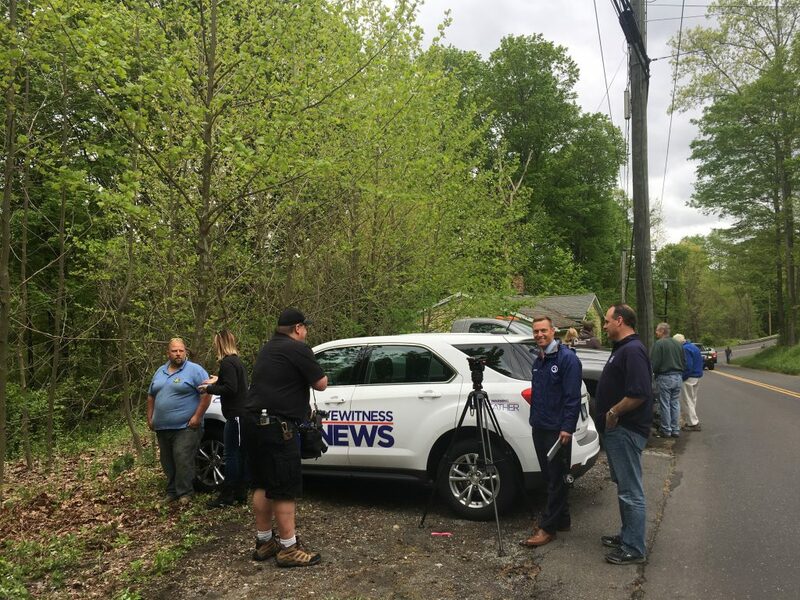 WFSB Channel 3 Eyewitness News aired an update May 16 on the 11 p.m. newscast about the community effort to build a new home for Carol Degen of Brookfield. The mother of two adult children hired a contractor years ago to renovate the kitchen and bathroom of her modest house alongside Stony Hill Road—and wound up with the house gutted, deep in debt, and essentially homeless. 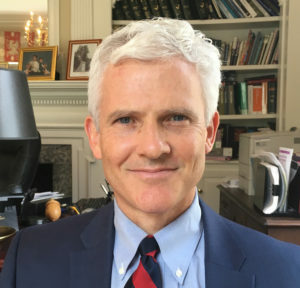 Channel 3, the CBS affiliate in Connecticut, first covered Degen’s plight in an I-Team investigative piece by Eric Parker, broadcast as the lead story on the 11 p.m. news last Halloween (Oct. 31). 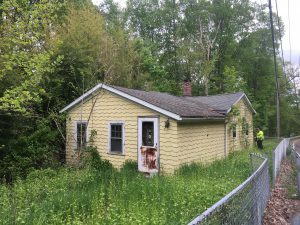 For the May 16 update, Parker came to Brookfield Monday, May 15, and met with Degen, her daughter, Susan, and volunteers who are laying the groundwork for the old house to be razed and a new one to rise up on the narrow site between the busy road and the Housatonic Railroad tracks. Eric Parker and the WFSB crew at the Degen property in Brookfield. Cramer & Anderson Partner John Tower filed suit against the Danbury contractor hired by the Degens and won a trial judgment of more than $471,000 that hasn’t been honored by the contractor. Attorney Tower turned to Parker, who is also an attorney, with the hope that publicizing the case would remind homeowners to beware and do their homework before hiring home improvement professionals—and also with the hope that a TV news story might inspire an effort to help a client who remains unlikely to benefit from the trial judgment. The reaction to the I-Team story was immediate and significant. News of the Degen family’s nightmare prompted Drew Scott from the HGTV show “Property Brothers” to tweet that he had seen the news story and felt bad for the family. More importantly, the story encouraged an outpouring of support from contractors, Brookfield residents and others who pledged to help the Degen family rebuild. Rick McCarty, a former Brookfield High School classmate of Carol Degen’s son, Billy, launched a Help the Degen Family GoFundMe page, which has raised nearly $4,000 to date. McCarty is president and owner of Brothers Outdoor Services, a landscaping firm, and he was on the Stony Hill Road site May 15, clearing brush and small trees as the rebuild effort proceeds. Ruocco was also at the house that day, introducing Eric Parker to professionals who have signed on to help the Holland Family Foundation finalize the project plans and get things moving. Among them is architect Kevin McQueen, principal of the Architecture Design Alliance, and civil engineer Russell T. Posthauer, Jr., principal of CCA, LLC, which was doing surveying work at the site Monday. Based on long experience and a history of successful outcomes in wide-ranging civil litigation for private clients, Attorney Tower often takes on more complicated cases involving construction, contract, property, business, and partnership disputes. Attorney Tower works in the firm’s New Milford office and may be reached by phone at 860-355-2631, and by email at jtower@crameranderson.com.